The use of gold in modern medicine began around 1890, when the distinguished German bacteriologist Robert Koch discovered that compounds made with gold inhibited growth of the bacillus that caused tuberculosis. His work was honored with the Nobel Prize in Medicine. Since then, medical uses of gold have expanded greatly. It is used in surgery to patch damaged blood vessels, nerves, bones and membranes. And it has been used in the treatment of several forms of cancer. 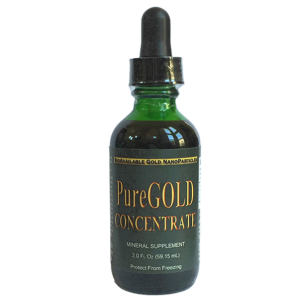 Gold turns on the anti-inflammatory functions of the body to alleviate pain and swelling from arthritis, bursitis and tendinitis. It may help rejuvenate glandular systems and provide anti-aging properties, raise IQ, and enhance function of the pineal gland. Gold has been used historically to treat digestive disorders, circulatory problems, depression, obesity, and burns. It is a catalyst for endorphin-like hormones as well as the mitochondrial antioxidant enzyme superoxide-dismutase (SOD). FREE-MART is taking gold to an entirely new level. Our negatively charged Nano Crystalline Gold particles are the most assimable form of gold ever discovered. Termed a mineral salt, these gold crystal particles will never fall out of solution and will never become toxic, and they can enter the cell and travel to the most remote parts of the body to turn on various bodily functions. Crystalline Gold is perhaps the best and fastest mineral for turning on the body’s ability to detoxify addictive substances, from simple sugars to alcohol, to tobacco, to the toughest and most addictive drugs. For maintenance, add 8 oz. Crystalline Gold to 1 gallon distilled water (MUST BE DISTILLED) and drink 4-8 oz. 1-2 times weekly; first thing in the morning. For therapeutic dose, add 8 oz. of Crystalline Gold to one (1) gallon of distilled water (MUST BE DISTILLED). Drink 8-12 oz. per day first thing in the morning for 10 days as a therapeutic dose for chronic or acute conditions. Note: If possible, buy your distilled water from a water store that distills it in house. If you must buy distilled water in a plastic jug okay, but do not mix the gold in a plastic jug, as it will quickly pull toxins out of the plastic. If you do not have a gallon glass jar for mixing, then pour 2 oz. (1/4 of a bottle) of gold into a glass quart jar and finish filling it with distilled water. Best then to store inside a cupboard or dark place out of the direct sunlight. Warning â€“ Gold activates impurities and therefore CANNOT be added to tap, well or filtered water. It must be diluted only with distilled water. Never use Gold at full-strength dilution directly in the mouth.Note: Most water sources are H2O negative. Distilled water is H3O positive. It is said to leach minerals out of the body, but in reality it will only leach minerals that are too large for the body to use. Distilled water is safe to drink as long as you are getting adequate minerals in your diet and it can actually benefit you by pulling out excess heavy minerals that have accumulated in certain organs. It can therefore be useful in removing excess iron, copper or other heavy metals and can reduce prostate swelling and increase urine flow by removing calcium buildup in that organ.